The cast of “This Is Us” appears at a Paramount Studios screening and panel in Los Angeles. Crews fore the hit NBC drama were reportedly filming in Philadelphia recently. 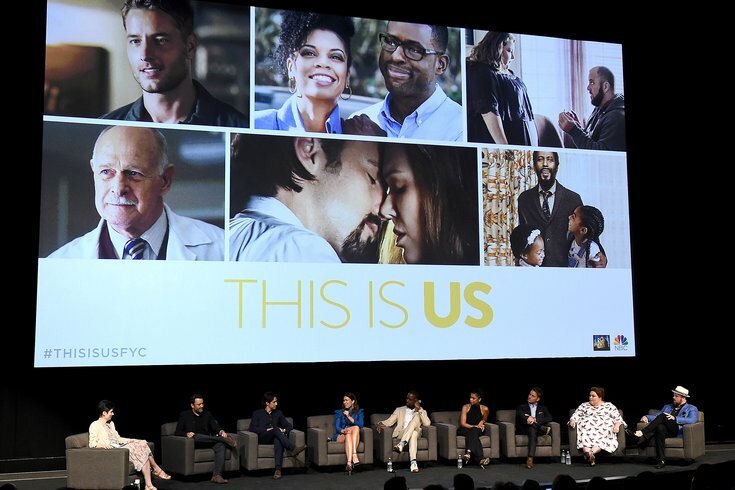 Everyone's favorite show to emotionally destroy you, NBC's "This Is Us," is coming back this fall with season (big) three, and it looks like Philadelphia is making a cameo. HughE Dillon spotted "This Is Us" crews at WHYY earlier this week, filming in the lobby of the public broadcasting network's building at 150 N. Sixth St. Pictures show "Fresh Air" host Terry Gross, most likely playing herself, opposite Justin Hartley, playing the ever-troubled Kevin Pearson. Though it's possible that the summer break gave us all renewed strength to stop dissolving into tears at every scene from "This Is Us," that refresher is enough to just ... whew. Tissues, please. Today, Aug. 31, also marks the birthday of four major characters in the show, Jack Pearson and his three kids. In honor of the occasion, "This Is Us" asking fans to celebrate on social media. Ahead of the date, Entertainment Weekly also gave a peek at the new season, including a still of Milo Ventigmilia (as Jack) and Mandy Moore (as Rebecca) on what looks like a first date in the 1970s. The new season of "This Is Us" begins Tuesday, Sept. 25 at 9:00 p.m. on NBC.